It was my first order and applying of Pika Pika Rain PREMIUM Ceramic Coating. I heard it was not difficult for women, so I decided to apply. There were only a small bottle, a microfiber cloth and 3 pieces sponges in the box. I was worried whether it is enough, but the liquid remained! First I did the preparation (I applied Pika Pika Rain Oil Remover). Now, let’s start for the application of Pika Pika Rain PREMIUM Ceramic Coating! but it spread very well so it was easier than I expected. Then half of the bottle remain. Regarding the time, I could finish to apply within half an hour. Then I tried to apply it to my family’s cars. I did the preparation and applied it to another Monkey. However, 12 hours has already passed so the ceramic coating was fine! It was complete different after raining! Almost all dirt was removed. I was very impressed it! I tested for my Monkey, but there was a difference between before and after the application! I also bought another bottle for daily car care, so I think I will keep my car beautiful for a long time. Must-read for BMW riders! Glass coating for your precious motorcycle! Wat is the best caring for a motorcycle? All of articles in our previous blog introduced car caring before. Thank you for waiting for this time, all of motorcycle riders!! This time we would like to introduce how to care for a motorcycle which is a must-read for all riders!! Some of you who tale a ;pmg rpad trip on a motorcycle might ride longer distance than car drivers. Your affection for your motorcycle which you have been riding for long distance anytime and anywhere should be so deep. However, cannot help avoiding from long-term deterioration even though you treat it carefully. In addition, the more you ride a motorcycle, it gets damaged due to many reasons… for example, exhaust gas, sand, dust, rain and so on. Some of you might think like this, but almost all must want to keep your own motorcycle beautiful as much as possible for a long time. Caring for a motorcycle is necessary to solve your dilemma. You might think like these. Of course, they are different vehicles and their ways of caring should be changed naturally. Actually, there are many products designed for a motorcycle. First, we would like to introduce about glass coating for a motorcycle from washing to surface treatment. The supreme caring with glass coating! Maybe some of you hardly hear about motorcycle glass coating as much as car glass coating. 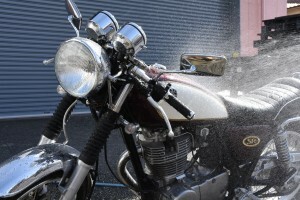 In fact, numbers of glass coating for a motorcycle is few, however, we highly recommend glass coating for motorcycle!! 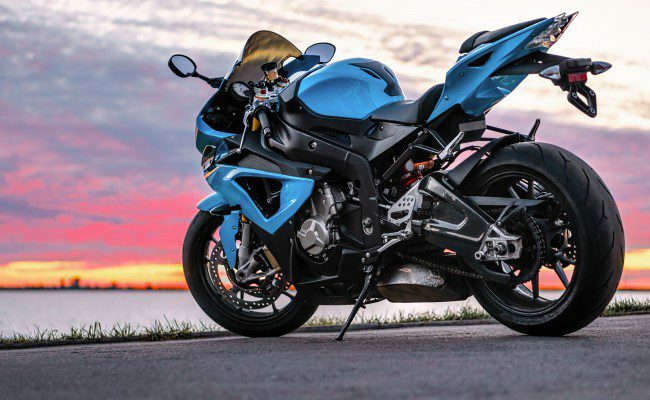 What is the reason glass coating goes well with a motorcycle? Applying glass coating makes a motorcycle glossy same as a car. Pika Pika Rain Glass Coating can apply from wheels to mufflers and they are covered with a luxury veil of gloss such the motorcycle gets wet. Moreover, the water repellency gets better and it makes wiping becomes easier than before, so you can save time for washing a motorcycle. There are many people who ride a motorcycle even though in rainy days. Your motorcycle should get dirty. However, if you apply glass coating, the dirt is hard to adhere and the hydrophobic power flown it away with rain. If a motorcycle gets dirty, it can be removed by washing. Of course, Pika Pika Rain Glass Coating can apply a helmet, so caring for it can be easier. Also the glass layer of Pika Pika Rain Glass Coating is very hard and it saves from scratches by fiction with your cloth. It can also save from a rust and degradation of plastic parts. This feature is quite valuable because car wax and polymer coating don’t have it. The durability of Pika Pika Rain Glass Coating is 3 years. 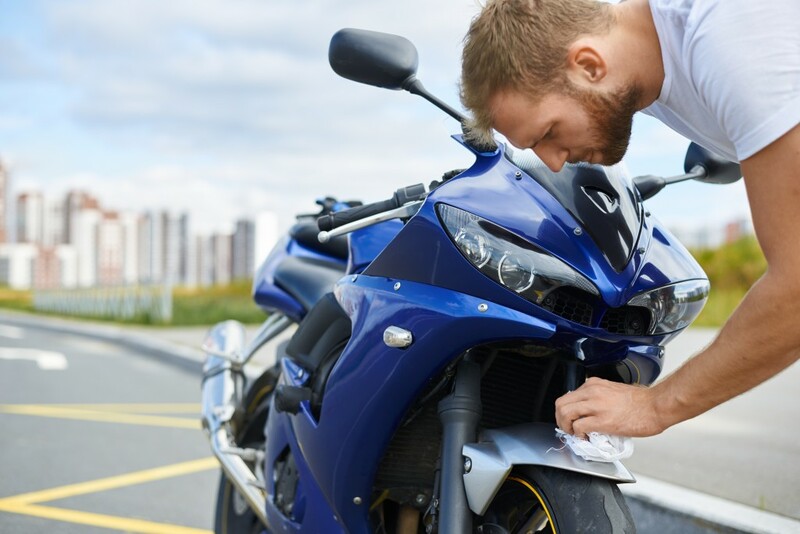 In a motorcycle case, there are many parts which is touched with the rider, however, you don’t have to be worried about glass coating adheres to your clothes or be removed by friction easily unlike car wax. Also the heatproof temperature of the glass layer is 1200℃, so you can apply to a muffler and you don’t have to be worried about beeing removed by heat. DIY glass coating is the best cost-effective!! We recommend DIY glass coating for you who think like above! Pika Pika Rain for Motorcycle can be applied all parts except rubber parts such as a tank, a front fender, a front cowling, an engine, a muffler, a front fork, a swing arm, around a handle, a flame, a seat coating, a wheel and a helmet. Of course you have to do all works from washing a motorcycle to applying glass coating by yourself. We recommend applying by detailers if you feel tired of DIY products, however, DIY is recommended because there are few areas which you need to apply and it’s cost-effective. A half day is enough to finish all works from washing to applying glass coating by yourself. Applying glass coating makes the protection and the gloss much better. However, daily caring is very important indeed. In the next paragraph, we’re going to talk about regular washing and caring for a motorcycle. Regular car washing is full of nice!! A motorcycle is getting dirty with exhaust gas, sand, dust, rain… and so on. We recommend to wash a motorcycle regularly in the same way as a car. Washing a motorcycle is a nice way that will be able to kill two birds with one stone: make your motorcycle beautiful and inspect the condition of the whole parts while washing. These are difficult to find out when you just ride a motorcycle. Speaking of washing a motorcycle, some people wash it with only cleaner on the market which is waterless, however, please always wash a motorcycle with water before you apply glass coating. It depends on which parts you want to apply glass coating, but if you apply the body which is still dirt, the dirt is shuttled in glass coating. Therefore you intend to make your motorcycle beautiful, but it has the opposite effect to what was expected. So, please wash your motorcycle with plenty of water carefully. It can wash the parts which is out of the reach of you and also a dirt which adheres on the back of gaps by daily drive can be removed. Now, we would like to explain washing a motorcycle with water in order step by step! The important preparation before you wash a motorcycle is taking water proof measures. 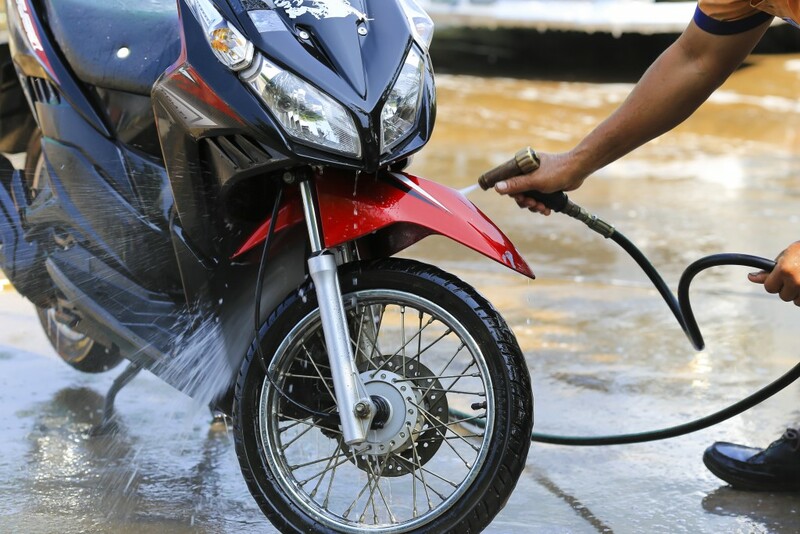 After taking water proof measures, wash off any dirt on the motorcycle body with a plenty of water. Please try to wash off the dirt which is not stubborn as much as you can. Making bubbles by Pika Pika Rain Car Shampoo (it can use for motorcycle, too!) and wash a motorcycle from above. 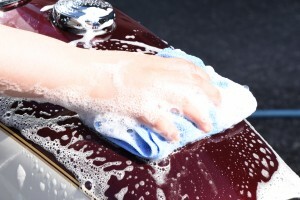 If you scrub too much, it causes scratch, so please wash a motorcycle with microfiber cloth softly like you stroke it. When you wash small parts where you cannot reach, using the tip of microfiber cloth or soft tooth brush. After you wash completely, let’s rinse with plenty of water not to remain bubbles. If you didn’t rinse all of them, the remained Pika Pika Rain Car Shampoo will damage a motorcycle. Therefore, please wash it off completely same as step (1). After that, please wipe off and dry with microfiber cloth or microfiber chamois. For water gathered in the inner parts, shaking a motorcycle or using a tip of microfiber cloth and using an air spray are good. If you need to dry it immediately, driving for a short time is one of the way. Then you might understand rough order of washing a motorcycle. Finally, just one more caution which you must not forget! When you wash a motorcycle with car shampoo, there is possibility to be washed off not only dirt but also oil and grease which is necessary for chain and working parts. If you drive without filling the oil next, parts life can be shorten due to worn and the motorcycle cannot put on speed well as you think. Therefore, please fill the oil absolutely. Before the application of glass coating!! Get the more gloss by a little effort!! How do you prepare for the glass coating? The application of glass coating is easy, but the preparation is surprisingly time-consuming. However, there is a big difference between you do the preparation and you don’t. Surely you will wash it first, won’ you? However, there are still some dirt and water spots which cannot be removed by washing. Then let’s assume we move forward on application of glass coating and then the dirt is coated, too. In this situation, glass coating doesn’t work enough. If some adheres on the car body, the degree of adhesion with glass is weaken and the capacity of glass coating may go down. Moreover, sometimes dust and sand on the car body though it looks beautiful after washing. Then, the preparation below can make glass coating effect fully. First step is basic washing a motorcycle. Let’s making bubbles with soft, microfiber cloth. In this time, you should use natural car shampoo which is not contained a polishing material. Also Pika Pika Rain Car Shampoo is natural, so please consider using it if you haven’t. Next, let’s remove iron filing which is stuck in the car body. When you touch the car body after washing, but you feel it isn’t smooth though it looks beautiful. This identify is iron filings. If you leave it, iron filings get oxidized and harm your precious motorcycle. Therefore, please deal with it. Iron filing can be removed with clay and an iron fillings remover. After removing them, please don’t forget to wash a motorcycle with water again. Let’s remove strong water spots which cannot be removed Pika Pika Rain Ion Deposit (Water Spot) Remover. Please make sure that once you apply glass coating even though there are water spots on the car body, you cannot remove them easily! Polishing with compound makes a motorcycle beautiful. It can solve almost all problems like scratches, water spots and so on. Pika Pika Rain Water spot Remover is for water spots which doesn’t cover a widespread areas. On the other hand, if you want to remove both of scratches and water spots, Pika Pika Rain Liquid Compound should be good. Sometimes a brand new motorcycle has already been applied wax when you take delivery it. In this case, you must remove everything with Pika Pika Rain Liquid Compound. This preparation is necessary process to make a motorcycle without any wax and coating. This is also very important. This work is a process to remove oil which adheres on the car paint and it makes the degree of adhesion between the car body and glass coating much better. We recommend to do it even though a motorcycle is brand new. The point of choosing an oil remover is the main ingredient which is matched with the glass coating. There are two types of them, one is alcohol and the other is oil and when you apply Pika Pika Rain Glass Coating, we recommend to use the alcohol type. Now, almost all preparation is finished. The finishing will be changed dramatically by a little effort, so let’s do the preparation without stint of effort before applying glass coating! By the way, if you need to apply compound for a large area, the work should be hard and time-consuming, so, please use a polishing machine as much as you can. It doesn’t mean that you must do all of them, however, the more you stick to the preparation, the more the finishing is beautiful. Therefore it might be good you will challenge from them as much as possible. This is perfect!! How to apply glass coating for a motorcycle!! After you finished the preparation, finally let’s go to the application of glass coating! It is very important to understand well about all of the works before you start. Please don’t do that in a blind way, let’s do that after you prepare necessary tools and appropriate situation. We will move forward with the next stage! This is very important before applying glass coating as a car. Please wash even though a motorcycle is brand new. Washing with only microfiber cloth, not a brush nor a sponge. Please add car shampoo liquid into the water (0.5-1?) of a bucket. Making bubble with power of a hose which is a type or shower or stirring with microfiber cloth and your hands. Next, please wash a motorcycle with a microfiber cloth carefully. A motorcycle has many small parts and some of them are not good match with water. Therefore, please take water proof measures for parts which you don’t allow get wet such as a key cylinder, a muffler and so on. Also please do not wash chain prats too much even though it cannot be used masking tape. Finally, please wash off bubble well and wipe off with dry microfiber cloth completely. You might think like above, but, this is a very important work for applying glass coating. It causes the finishing of glass coating, so please don’t too lazy to do it. There are many ways, but please choose the easiest way for you from below. This is the quickest to cut the water. However, on the other hand, there is possibility to adhere dust on the car body, so please wipe hole of the motorcycle after you drove. This is an oriental way, but it can cut most water. It also can cat water, but please use a sheet not to pile dust which is in the air if it’s possible. There are few people who have it, but it can blow water which is in the small prats away. Please utilize it if you have. Finally, you can star the application of Pika Pika Rain Galss Coating!! – Please make note that Pika Pika Rain CANNOT apply to chain parts, around the break, shields, rubber parts such as tiers and window shields. – We recommend to repeat applying the surface of the car body into small areas, not to apply for a spread area at one time. After that please add a small amount when the sponge makes squeaky noise. 2. )Apply to the car body with the sponge thinly. At this time, if you apply it same direction makes finish better. 3. )Immediately wipe the area where you applied in step2 with Microfiber Cloth. Do not　leave a long time as car wax. 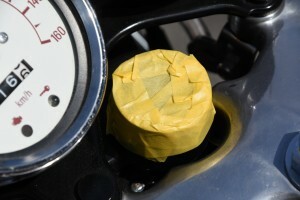 Spread the solution and make a thin, even layer to the surface of the motorcycle. The application is finished if you can check whether you applied evenly under the sun light. Please do not allow your motorcycle get wet for 12 hours after the application. Rain and night dew as well. If you get wet, please wipe the water with Microfiber Cloth immediately and softly. That is how to apply Pika Pika Rain Glass Coating for a motorcycle. It is also introduced in our video below, so please have a look it before you apply. On the whole, it might be time-consuming, however, your shiny motorcycle should blow away your tired away! Let’s drive your motorcycle like brand new forever! However, it doesn’t mean that it doesn’t get dirty definitely. The duration of glass coating depends on the situation of keeping and the frequency of driving. Therefore, after all, the daily caring means a great deal in the end. We can understand you feel tired like these very well. Of course, it is the best if you can do all, but, you should better to do only you can possible from those first. Still much better than when you don’t anything. Your motorcycle can be beautiful much as you take care of it. When you think in this way, your daily caring might become more joyful!! Let’s keep on driving your motorcycle which like brand new forever! !